AS the country yesterday attempted to digest the EU referendum result, the only arbiters as to who was in or out at Chester-le-Street last night were the umpires. Cricket felt a long way away from the political situation, but no less reassuring for its presence in an uncertain world. Quite what the King and Queen of Lesotho made of it all – both the EU result and the cricket – is anyone’s guess. Their Majesties were at the Riverside last night as special guests of Durham County Cricket Club, whose commercial and community director, Michelle Carney, spent 18 months in the African country running a charity with which the royal couple are closely connected. Under the circumstances, it was perhaps fitting that Durham marked their visit with victory over Yorkshire by six runs under the Duckworth-Lewis method, the hosts’ score standing at 68-3 from 9.5 overs in reply to 134 when a heavy storm ended play. The King might have been forgiven, however, if he had split loyalties. According to his Wikipedia entry, Letsie III was educated at Ampleforth College in North Yorkshire. He is also said to be a keen cricket fan, which makes him alright by us. On a muggy evening, where the royal couple were among a crowd of 5,757, the game was preceded by more peripheral entertainment than you could shake an EU ballot paper at. The match ball was brought to the ground by a parachutist, while a mini fireworks display greeted the players as they took to the field. The King even tossed the coin before start of play – inadvertently jinxing Yorkshire captain Alex Lees, who lost his first toss of the summer. One doubts that Lees, the 23-year-old appointed Yorkshire’s one-day captain last December, would have envisaged his duties to have included greeting African royalty before a T20 group game. Once the fireworks had finished, leaving a trail of smoke across the ground that did not clear for several minutes, Yorkshire lost their first wicket to the fourth ball of the match. Adam Lyth, who was almost caught from the first delivery when he drove Chris Rushworth to the boundary practically through the cover fielder, Mark Stoneman, aimed a wild slog and was bowled. Lyth has batted brilliantly in recent weeks, with two explosive centuries in the Royal London Cup, and will not need telling that there is a fine line between positivity and recklessness. 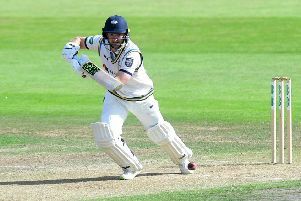 Kane Williamson also departed in disappointing style, bowled around his legs trying to sweep the pace of Rushworth to leave Yorkshire 34-2 in the fifth over. Yorkshire were given impetus by Lees, who scored a fluent 43. The left-hander hit eight fours and a six in a 24-ball innings, ended when he was brilliantly caught by Michael Richardson diving full-length to his left at long-on off Scott Borthwick. The trend of soft dismissals continued, however, when Gary Ballance top-edged a reverse-sweep off Borthwick and was caught behind. Tim Bresnan struck a breezy 19 – including a straight six off Borthwick – before edging a leg-side heave off Paul Coughlin to the wicketkeeper, while Andy Hodd skied Usman Arshad to mid-on. Azeem Rafiq sliced Rushworth straight up to give the bowler a comfortable catch and his third wicket, Rushworth finishing with T20 career-best figures of 3-14 from four overs. Josh Shaw was run-out after a mix-up with Jack Leaning, who top-scored with 48 from 36 balls with six fours before scooping Arshad to short fine-leg in the penultimate over. Steve Patterson was floored by a ball from Coughlin that hit him where no man wants to be hit, and when Patterson was caught behind trying to pull the next delivery, Yorkshire were all-out with three balls of their innings unused. Only three batsmen reached double figures as the visitors lost their last six wickets for 32 runs in six overs. Durham also lost wickets carelessly. Phil Mustard sliced Bresnan to mid-on; Stoneman spooned Rafiq to long-off, and Ben Stokes – playing as a batsman in his first appearance since last month’s Headingley Test - was brilliantly caught at cover by Williamson, who did well initially to parry the hard-hit cut shot off Lyth. At that stage, Durham were 38-3 in the sixth over, and Yorkshire were apparently back in business. But the hosts were just ahead of the D-L score when rain began to fall, and Ballance dropped Ryan Pringle at long-off off Rafiq moments before the umpires took the teams off the field, which might have seen the outcome – as close as the referendum result in the end - go the other way. Lees will lead a young Yorkshire team in a four-day match against Pakistan A starting at Headingley tomorrow. Yorkshire are without a first team game proper until Friday, when they take on Lancashire at Leeds in their showpiece T20 fixture of the summer. Yorkshire squad versus Pakistan A (from): Brook, Callis, Carver, Coad, Gibson, Leaning, Lees (captain), Rafiq, Read, Rhodes, Wainman, Waite, Shaw.